Explore our blogs, webinars, brochures, and more to find out how to strengthen your business' cybersecurity. 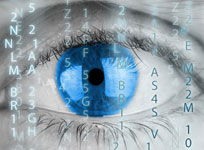 What are insider threats, and how can you prevent them? Find out in this blog! 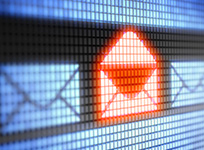 Business Email Compromise attacks are sophisticated, targeted schemes that have the potential to cause massive damage to your organization. Read the blog to learn more. The trend of human error in security incidents is continually growing, are your employees properly educated and trained? Read our latest digest to discover how your business can boost its human firewall. Learn about the breach that's bigger than Equifax in this blog. 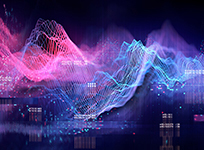 What could come of this breach, and how can you defend your organization from cybercriminals who have taken advantage of the Exactis leak? 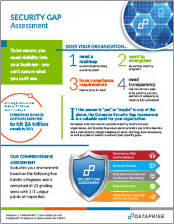 Discover the benefits of the Dataprise Cyber Security Gap Assessment. 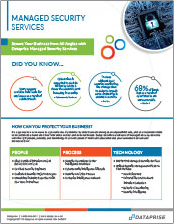 Learn how you can protect your business with Dataprise Cyber Managed Security Services. 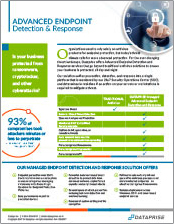 Learn more about Dataprise Cyber's Endpoint Protection and Response offering. 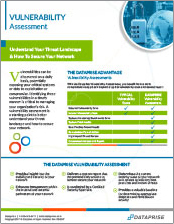 Learn how you can evaluate risk with Dataprise Cyber's Vulnerability Assessment.